A section to post your reviews of other Sega console games. Poll: What would you give Sonic 3D Blast? About a month ago, I reviewed Sonic 3D Blast for the Genesis/Mega Drive. Now that I've obtained a Saturn console and a copy of 3D Blast for the Saturn, I feel like comparing the two games in a review and see which one is superior. 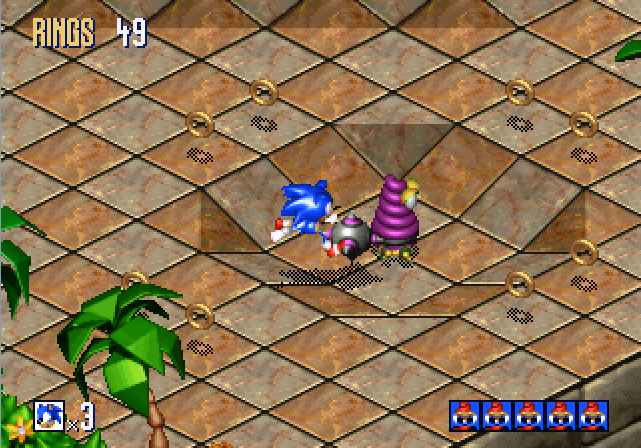 This is the Sega Saturn version of Sonic 3D Blast. The year was 1996. Newcomer Sony and their PlayStation console was dominating, and Nintendo was about to revolutionize the industry with the Nintendo 64 and its killer app, Super Mario 64. Sega, in the American market, was in trouble. Trouble that was exasperated by the numerous amounts of poor decisions internally that led the Saturn down the path to commercial failure. The last hope for the Saturn's future was a brand-new 3D Sonic game in the works--no, not 3D Blast, but Sonic X-treme, a game that was developed while Sonic Team worked on other projects, such as NiGHTS, and heavily promoted, hyped-up and anticipated for a Christmas 1996 release. However, Sega was unimpressed with the team's demos and efforts to port the engine from PC to Saturn, so the project fell under development hell until the head programmer of the project, Chris Coffin, was left to work on the project, spending entire days in his office. Eventually, he was diagnosed with pneumonia and had to stop working on the game for his life. And thus, Sonic X-treme went unreleased. To compensate, Sega commissioned Traveller's Tales, a third-party publisher that, while their game's qualities varied, had made pioneering effects and achievements on both the Sega Genesis and Super Nintendo that were used in their games. From the Mode 7-esque rotating floors and towers in Mickey Mania to the hardware-defining 4-channel music in Toy Story, Traveller's Tales could make magic happen on even the most rudimentary of hardware. That being said, did Traveller's Tales manage to push the Saturn to its limits with this version of the game? Let's find out. It's really nothing special. Somewhere in the vast oceans of Earth lies a small isolated island shrouded in mystery, only known as Flicky Island. The island inhabits the Flickies, peaceful birds that have a connection to the Chaos Emeralds. Robotnik finds this out, and sets off to Flicky Island to solve the mystery, and in the meantime, capture and harness the power of the Flickies for his own misdeeds. Sonic and friends also decide to visit Flicky Island, expecting the sight of birds roaming freely, but instead robots built by Robotnik, waiting for Sonic's entrance. Sonic pops open a Badnik, and sees a Flicky emerge from the machinery. He knew instantly that the mad doctor was behind this, and sets on an adventure to gnab the Chaos Emeralds, save the Flickies and stop Robotnik for good! This is not your typical Sonic game, first and foremost. To start, the level maps are isometric, as if you rotated a 2D level 90 degrees. To make up for the somewhat baron parts of the level, Sonic destroys 5 badniks and collects the Flicky contained inside each one. Gather the 5 Flickies and take them to the goal ring to move on to the next part of the stage. While the Flicky mechanic adds some difficulty to the game, and a bit of exploration, it has a few annoyances. First, hitting enemies in the first place can be a chore in itself due to the strange angle and slightly sloppy controls. Second, holding on to the Flickies is also difficult, especially in the later stages. When Sonic gets hit without a shield, all of the Flickies are freed, so Sonic has to collect them again. This wouldn't be so bad if the green Flickies weren't so disobedient that they sometimes appear to move away from you, or the Flickies are flying directly over lava or other hazards. Also, when Sonic is running at full speed, the Flickies form a long line behind him, leaving them wide open for enemy attack. Thankfully, Sonic at least doesn't control too badly, if a bit slippery. TT was smart enough to give Sonic the ability to move normally in eight different directions, unlike some arcade isometric games, where the up button would move the player up-left, and so on. After a bit of time to get a feel for the controls, I didn't have much of an issue taking out baddies either. These control issues are somewhat remedied (okay, not really) on the Saturn version by having support for the 3D Analog controller. However, although it does give Sonic a better feel, it's still not true 360-degree movement and still only allows for the eight directions you could on a D-Pad. This isn't the only problem either; the controls do need to be tighter for easier jumps, and Sonic needs to move faster at full speed. I sometimes find myself running through empty parts in the levels, feeling like it would never end because Sonic moved a bit slower than I'd like him to. However, there is something that ruins the flow of the game; LOAD TIMES. I know that most early CD games had long load times like Ridge Racer, but it's especially apparent in 3D Blast. ON AVERAGE, it takes about 20 seconds to load the next level. Even worse, after a special stage, it takes about 40 seconds to load out of the special stage and into a regular level; this is pretty bad, especially since it takes about 10 seconds to load into the special stage. You don't even get a cool mini-game to play while it's loading like in Ridge Racer (probably because Namco PATENTED that so only they could do it). Overall, the gameplay is decent enough, but it needs improvements in some areas. This is where the differences between the Genesis and Saturn versions begin. This is pretty much a no-brainer; having much more advanced graphical capabilities, the Saturn version comes on top visually. Each zone has added effects that build on top of the already appealing graphics of the Genesis version; more detailed floor patterns, more animation in foreground sprites, added weather effects in Rusty Ruin and Diamond Dust, and higher quality sprites in general. But are these added graphics really impressive? Do you see where this tileset could case some issues, especially when traveling at blinding pace? In conclusion, the graphics in this version look better, but they can be distracting and really aren't impressive enough for the system. It makes me think that a Saturn version of this game was a failsafe decision at the last minute in case Sonic X-treme was cancelled (which it was). Moving on. Your typical beginning zone--lush palm trees and checkered floors abound. Sets up the game pretty nicely, and that's about it. Abandoned ruins that are cursed with ancient flamethrowers and slightly annoying platforming sections. Casino/pinball-themed zone. Can be very frustrating if you're not careful; definitely proceed with caution. Very fun winter-themed stage with ice physics and avalanches that you climb up to proceed. Those shooting snowmen are assholes though. Obligatory antagonist factory zone with lots of tubes and electrical hazards. Obligatory antagonist factory zone with lo--hey, this is Gene Gadget again! To be fair, there are a few differences; in Act 1, Sonic breaks capsules with Flickies in them instead of collecting them from enemies, and you don't collect any Flickies in Act 2 at all. Knuckles and Tails are also nowhere to be seen. Only accessible if all of the Chaos Emeralds have been collected. As far as final boss standards go, this isn't too hard, but can make you mess up if you crack under pressure. Hidden in the levels of 3D Blast are Sonic's fellow companions, Tails and Knuckles. If you happen to find either of them with 50 rings, they will transport you to one of the 3D special stages. And yes, they mean it this time. Unlike the Genesis special stages, these ones use true polygonal 3D graphics and have a fair amount of difficulty. They are based off of the ones from Sonic 2, where you're traveling down a half-pipe collecting rings and avoiding obstacles (though with less focus on memorization). Alongside being truly 3D, these stages also bring in new twists, like the half-pipe swirling like a corkscrew at points, some platforms to jump on to grab more rings, springs that bounce you up to a platform or the next part of the stage, and red accelerator pads that send Sonic speeding off in one direction without any left or right agility. The B button also makes him roll, but I haven't found a use for this. Sonic 3D Blast's Genesis soundtrack was composed by the great Jun Senoue, who would go on to make original songs in the Sonic Adventure games, and it showed. Many of the pieces were brilliantly mixed and played to make one strong soundtrack out of the rudimentary Genesis sound chip. The Saturn version has a completely different CD-quality soundtrack composed by Richard Jacques, who would also create music for, um...Sonic R.
Right then, his compositions for this game are interesting; they don't have the same Sonic feeling as Jun's soundtrack does, but it's still strong in its own rights. Green Grove has a groovy tropical theme, especially in Act 2, Rusty Ruin has a slightly somber and ｖａｐｏｒｗａｖｅ　りッだ-ish piece, Spring Stadium has a jazzy casino theme for Act 1 and a mockingly happy and busy amusement park tune for Act 2, Diamond Dust is pretty much a Christmas melody, complete with guitars in Act 2; Volcano Valley is a cinematic Pirates of the Carribean-like composition that gets more dramatic as you move into Act 2; Gene Gadget is rave techno music, and Panic Puppet is a tech-ish final level theme that amps up in Act 2. It's a solid soundtrack, but it falls a bit on the generic side compared to the Genesis soundtrack. The Saturn version of Sonic 3D seems to be pretty decent like its Genesis counterpart. What do the scores say? Rough around the edges, but can be fun once you get used to it. The load times do bring it down a bit compared to the Genesis version though. Full-motion video cutscenes help this version to succeed over the Genesis version, making use of the Saturn's ability to display them. Still, not as impressive as what Jon's team was able to do on the Genesis. With added visual effects, this version definitely looks better than the Genesis version, but again, not impressive enough for the technical powerhouse the Saturn is. Although not quite as strong as Jun's soundtrack, the Saturn version has quite a few hits that are worth listening to. Sonic 3D, while fun, is a bit hard to go back to; the overall mixed reception in the public eye does not help. Nice review. I've never played this yet. I hope to someday. tl;dr: 3D Blast on the Saturn is a decent counterpart to the Genesis version, but it's clear that it was a last-minute failsafe decision to make this port due to long load times.